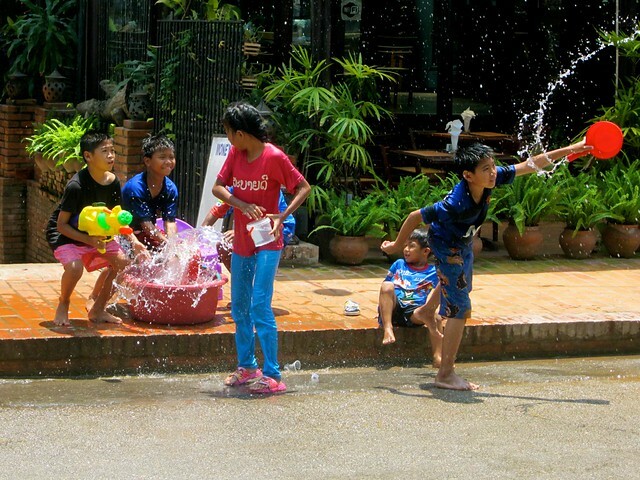 Our Thai visa ended two days before the start of Songkran when we were in Chiang Mai. 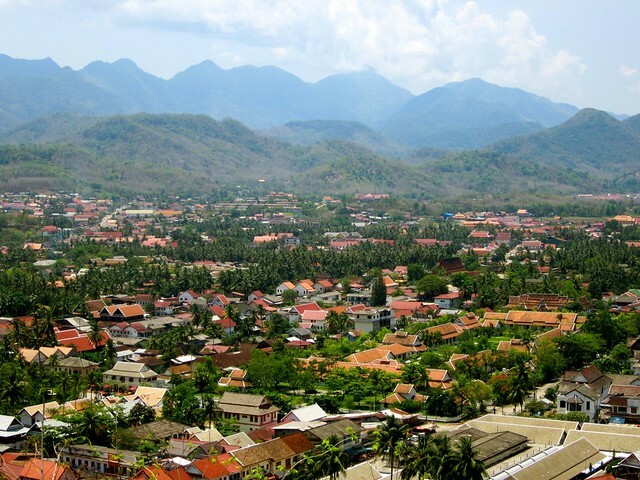 Most travelers would have done the sensible thing, a quick visa run to the border, and then back to Chiang Mai to celebrate the New Year in one of the most exciting Thai cities for the celebration. It would cost $80 per person to extend our visa for 30 days (Or risk paying a small fine for overstaying a few days), which is another option that most travelers most likely would have done. We didn’t want to do a visa run since we plan on returning to Thailand a few more times in the coming months. 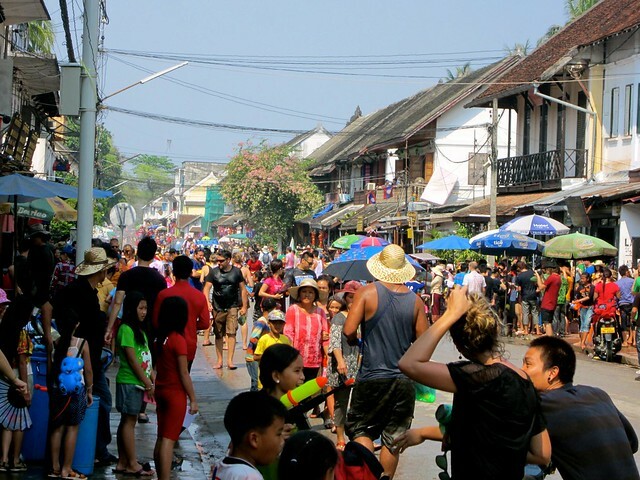 We weighed our options and considered the alternative: Lao new year in Luang Prabang. 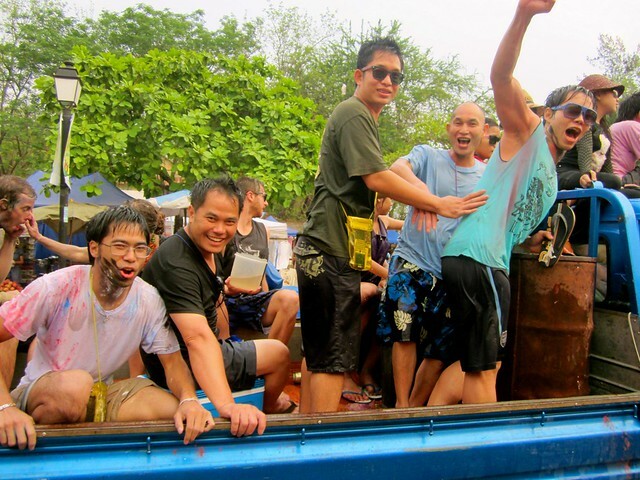 It sounded like a similar event and missing Songkran in Chiang Mai only gives us a stronger incentive to return for a future years’ celebration. So we rung in the new year in Luang Prabang with the locals riding in their trucks, music blaring and buckets of water in hand. This is the one weekend where you can’t escape being soaked. The water throwing starts early in the morning and no one is spared. Kids seem to start early we found out while riding our bikes to Kouang Xi waterfall and got continually drenched with water by young kids waiting for us in the small towns along the way. 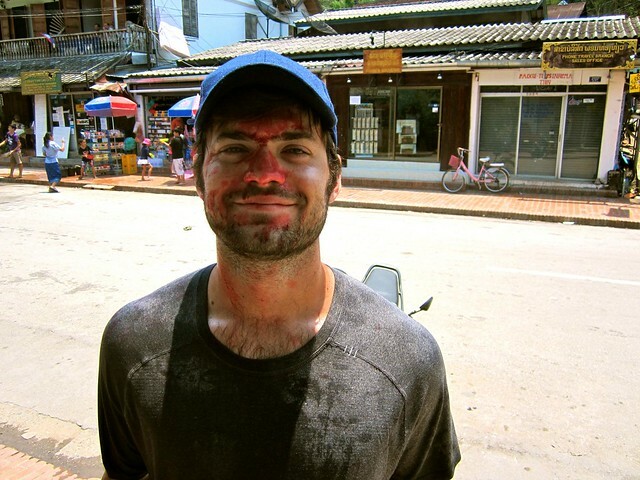 The Laos heat dried us off in no time. Friday is the first big celebration. 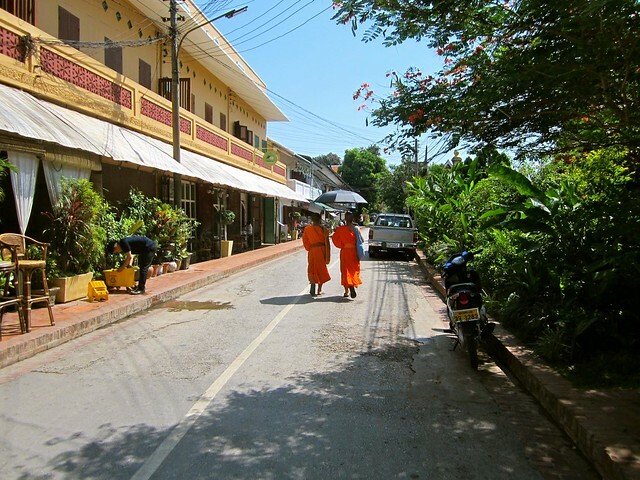 It centers around cleaning the house, preparing the food and making offerings to the monks. Together the people and the monks pour perfumed water over the buddha statues for good wishes. Saturday is the big parade. Families come together and wish each other a year of health and happiness. Every street corner and guesthouse in the city is occupied by a full bucket of water ready for any passerby. The water being thrown gets more plentiful and many more colors are added in by food dye. At first you are just wet and then suddenly your t-shirt is many shades of blue, orange and red. 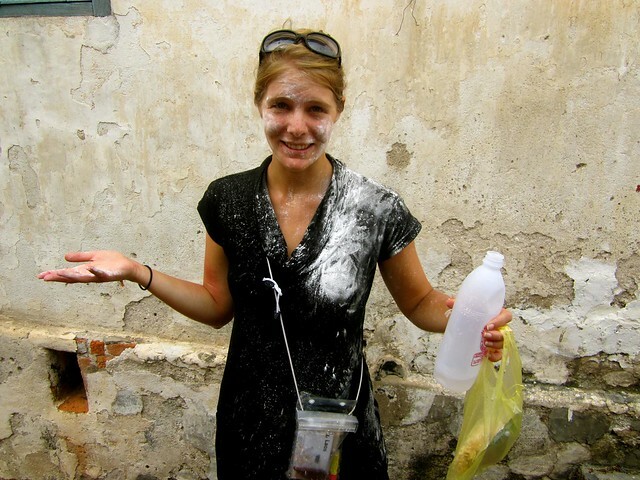 In addition to the colors, corn starch is thrown to coat you in white powder as a sign of protection and to ward off evil. Sunday is a day for locals to give offerings to the monks and release caged animals in a symbol of casting away sickness and ill will. Of course, the partying continues, the water increases and the music only gets louder! Here are some helpful hints to hold your own and have fun during Lao New Year. You are arriving during one of the biggest celebrations in Southeast Asia. You can’t come to Luang Prabang, or any of the major cities in Laos or Thailand and expect to partially participate in the new year. This is a city-wide water assault. You might think you can sneak out for a bottle of water or quick snack…WRONG, the kids and teenagers (and other tourists) are waiting for you around every corner and no one gets away dry! Unfortunately, you will see the tourists who didn’t do their research and they will be visibly upset and frustrated that they are drenched. You should know what you are getting into and be prepared for a fun weekend! You will see some women dressed very nicely driving by on motorbikes and they will be quick to wave their hands at you and ask not to get wet. Be respectful, the weekend is meant to be fun and while most everyone will be free to soak, there are a few you want to avoid. Also, avoid throwing the water in others’ faces. In the heat of the moment you don’t always think straight, but the head is sacred and you will see most of the kids aiming for your shoulders and below. Follow their lead! Your clothes will be soaking wet 90% of the time you are outside. The water could be mixed with food coloring or starch…or who knows what. Nothing harmful, but you never know what will come out of the next water gun or tossed bucket. Your clothes will most likely be varying shades of orange, blue, red or black with starch or flour thrown over you to coat everything. Trust me it is fun! Avoid anything white, once the water hits it will be see through and you might not like to show the city what is under your shirt! Especially for women I suggest thinking through your clothes considering how they will stick to you or quickly become inappropriate if wet. The Lao culture is very conservative (regardless of how you might see some of them behaving) so keep this in mind when you dress. No one has fun getting buckets of water thrown on them. The fun comes when you fight back and turn the tables. Water guns are sold on every street corner in every size you could want. Buy a bucket, or even carry around a water bottle. You must have something to douse your attacker. Warning: If you want to refill with someone’s hose along the way you will most likely get 3 buckets of water poured over you depending on how generous the group is feeling. YOU ARE GOING TO GET WET AND DIRTY! Deal with it. Don’t be the foreigner who didn’t do their homework and didn’t realize they’d be in the city for the new year. Enjoy it for what it is and join in the fun. You’ll have a much better experience and maybe make some new friends as you team up to soak everyone passing by. I remember the last day walking out of my guesthouse, secretly hoping to escape, walking out of my way to avoid the usual corners…and SPLASH! Not only water but corn starch. You stand there drenched and dirty and no matter how frustrated you might be, remember where you are and just smile and laugh. The new year almost always starts 2 days early, if not before. Don’t assume if you arrive with all of your bags you will be spared. Bags and all, you will get soaked. If you prefer not to arrive in a city with everything you own wet and colorful I suggest planning to arrive 2 – 3 days early. We also made the mistake of scheduling our bus out for the last day. We thought we could sneak out avoiding the masses early in the morning, but forgot about arriving in Vang Vieng that evening. Our nice tuk tuk driver would slow down as he passed all the kids so they would have time to throw all the water they had available on us. We were soaked. All in good fun, but very wet! Remember these 7 simple tips and have fun! We were in town for the New Year celebrations in 2012 also and had so much fun! What an amazing experience and what a fantastic culture. One of our ´special moments´of this trip. 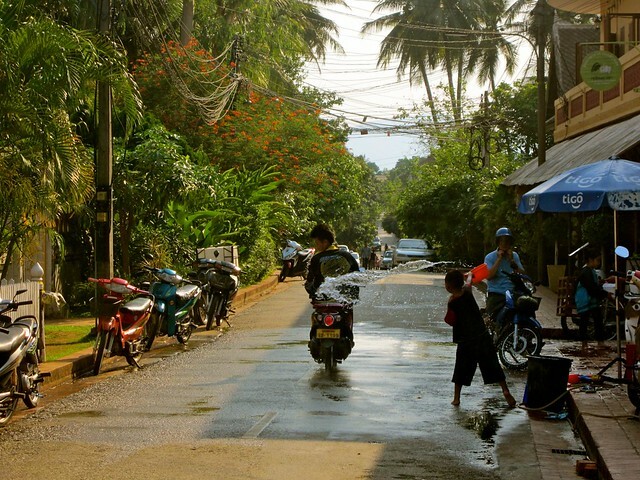 We absolutely LOVED Laos! That’s awesome, we probably passed you guys on the street and didn’t even know it. It was a definite highlight for us too. Makes us want to find the local Thai and Lao populations in the U.S. having their own celebrations!